A first-person look at the annual hunter pace horse competition. I arrived at Tashmoo Farm at 8:30 am dressed all in blue, because that’s the color my horse would be wearing. Of course we had to match. I was preparing to ride in my very first hunter pace, an equestrian competition where teams of riders follow a marked route across varied terrain and over myriad obstacles, attempting to complete the course as close as possible to a predetermined time. 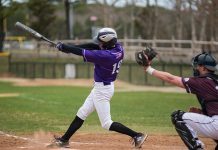 The Martha’s Vineyard Horse Council hosts a hunter pace in the State Forest each fall, raising money for their MVRHS scholarship. This year, 30 riders participated, and I finally had a suitable mount to count myself among them. 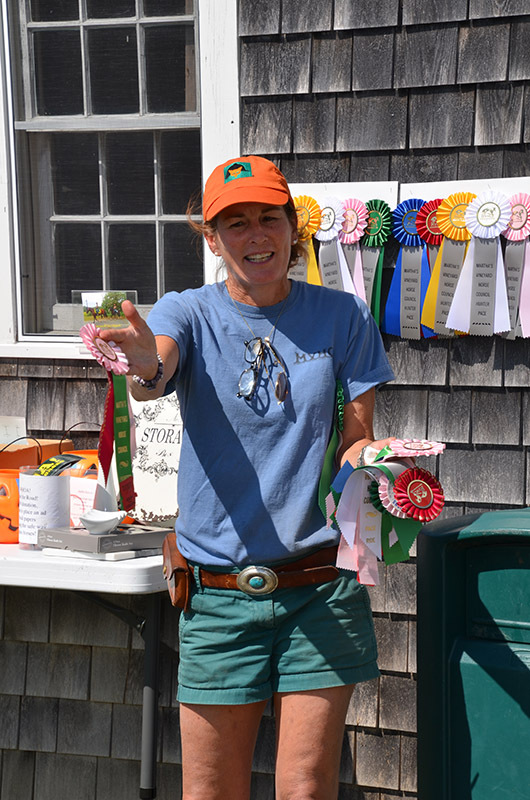 Stephanie Dreyer, hunter pace enthusiast, West Tisbury school librarian, and organizer of the annual event, was kind enough to loan me her horse for the day. 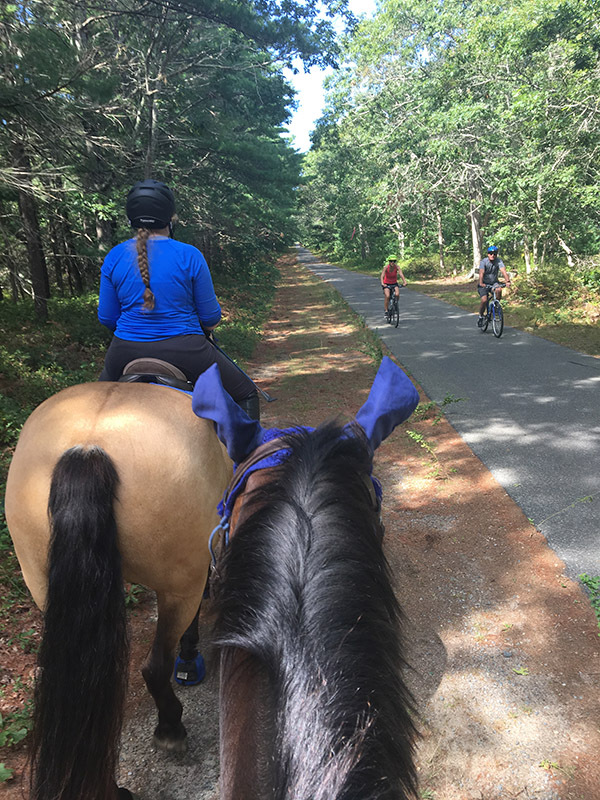 Years of exploring the Island on horseback has given her impressive inside knowledge of riding trails, and I have been lucky to ride with her this summer. She knows the best place to park a horse trailer at Sepiessa, which open fields have the best footing for a canter, and where along a riding trail to suspend conversation, lest you risk irritating a particular set of homeowners who prefer absolute quiet on their back deck. Stephanie’s horses, Teddy and Michael, are the perfect trail adventurers. Sturdy, placid, and ever-willing, these two good boys step onto their trailer with ease and yawn in the faces of barking dogs. Turns out they also look great in blue. 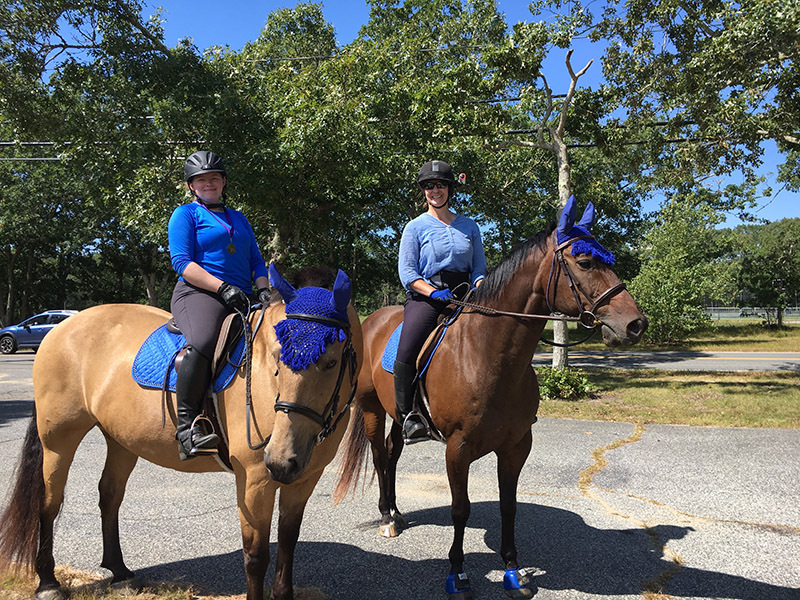 They were outfitted for the occasion in matching blue bell boots (plastic boots that protect the front hooves) and blue saddle pads embroidered with the shape of the Island, and were capped off with a bright blue fly bonnet to protect ears from biting insects. Teddy would be ridden by Edgartown native Evonne Kelly, and I would follow behind on Michael. The blue team was looking sharp. 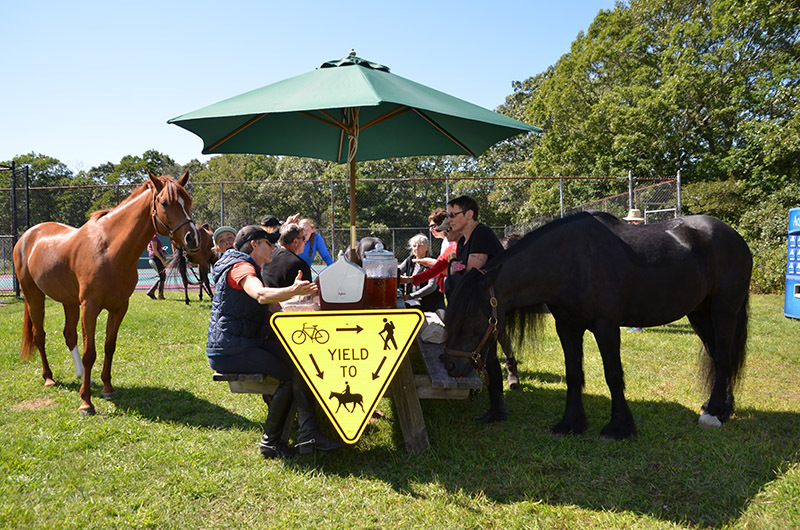 We mounted up in West Tisbury school parking lot, clopped across Old County Road, and headed into the woods. Bright pink ribbons were clothespinned to trees, making an easy-to-follow route through the forest, with its miles of wildflowers, untidy grasses, poison ivy, and scrub oak, crisscrossed by dusty fire lanes. Most of the foliage was still summer green, but creeping fall revealed itself in some of the ferns, curling into crispy brown flags that peppered the landscape. For more than 10 miles, Michael and I followed Teddy’s ample buckskin backside, past dog walkers and bicyclists, up hills, down embankments, past the heath hen sculpture, and through broad meadows buzzing with insects. We traveled at our own pace, jumping some of the smaller obstacles, maneuvering carefully around others. Evonne trotted Teddy toward one small white fence lined with hay bales. Instead of soaring over, he stopped short and plucked a mouthful of hay. Luckily, we got no points off for snacking. Stephanie met us at the finish several hours later to offer “her boys” congratulatory kisses. When all the riders arrived safely back at the school and horses were loaded onto their trailers, we gathered for cheeseburgers and iced tea and waited to hear our standings. Several ponies grazed alongside the picnic table. 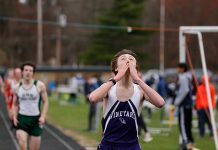 First place went to Laura Marshard, Jack Marshard, and Charles Silberstein, who rode the entire course in two hours on the nose, the exact optimal time. 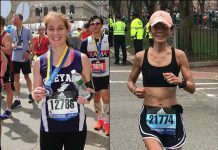 Evonne and I just made it to the ribbon placing, snagging a green sixth-place ribbon with our ride of two hours and 20 minutes. 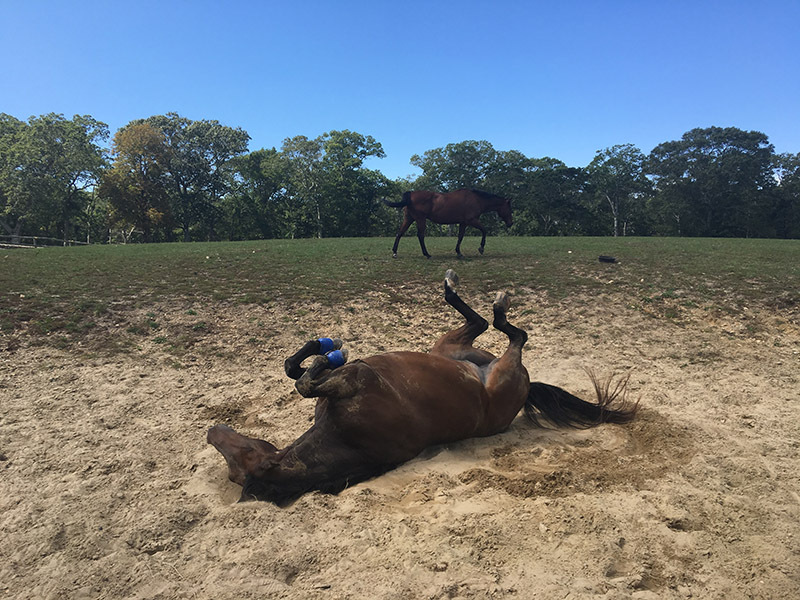 Trusty Michael, having arrived back at Tashmoo Farm after a job well done, heaved himself onto a dusty patch of his pasture and took a well-deserved roll. I went home and passed out immediately, still in my riding pants, dreaming of next year’s ride.